The United Nations Relief and Works Agency for Palestine Refugees (UNRWA) said, on Monday, that its mandate comes only from the United Nations General Assembly, which created it in 1950 following the Palestinians’ dispersion from their homeland, with Israel’s creation by a UN resolution in 1947. 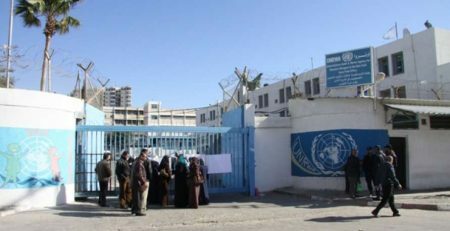 UNRWA’s response came after Israeli Prime Minister Benjamin Netanyahu called for cutting aid to UNRWA until it ceases to exist. “UNRWA is an organization that perpetuates the problem of the Palestinian refugees. It also perpetuates the narrative of the so-called ‘right of return’ with the aim of eliminating the State of Israel, and therefore UNRWA must disappear,” Netanyahu said on Sunday. The UN called, in its General Assembly resolution 194, passed on December 11,1948, for the return or compensation of more than 700,000 Palestinians who were forced out of their homes and land by armed Israeli paramilitary groups. Netanyahu’s statement came after US President Donald Trump and his UN ambassador, Nikky Haley, had also threatened to cut financial aid to the Palestinians, including to UNRWA, if the Palestinians do not return to the negotiation table with Israel. The US is the largest single donor to UNRWA, with over $350 million in annual official aid. However, a senior US administration official denied, on Sunday, that a decision has been made on cutting aid to UNRWA. UNRWA, which is suffering from shortage in budget, is appealing for $400 million in aid to meet humanitarian demands by Palestinian refugees, whose number has reached over 5 million since 1948, particularly in conflict areas such as Gaza and Syria.